10 Surprising Tips To Eat Healthy & Lose Weight - Is Disease Hereditary? These are results and excerpts from observational studies conducted by Dr. Brian Wansink and his team that were published in his insightful and entertaining book, Slim by Design: Mindless Eating Solutions for Everyday Life. An astute observation was that if you want to be slim, simply do what slim people do. Women who had even one box of breakfast cereal visible anywhere in the kitchen weighed 21 pounds more than their neighbor who didn’t. Similarly, the average woman who kept a bag of potato chips on the counter weighed 8 pounds more than her neighbor who didn’t. Don’t have an empty kitchen, keep food in it. If you don’t have food in the kitchen, then you tend to order out more…and that is generally NOT healthy food. Good foods to keep on hand to curb hunger include protein (such as sliced turkey), yogurt, eggs, and pre-cut vegetables & fruit. Put a fruit bowl containing at least 2 types of fruit within 2 feet of the most common kitchen pathway. 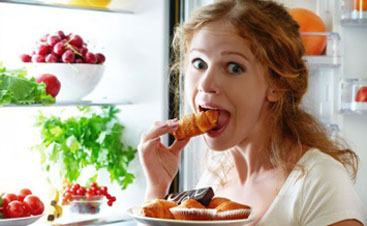 Hide unhealthy food on the bottom shelf of the pantry behind closed doors and put healthier items front and center. 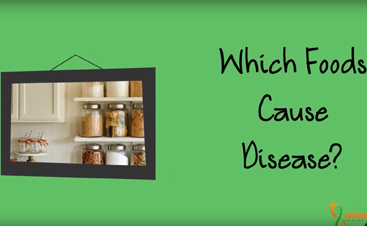 You’re 3 times more likely to eat the 1st food you see in the cupboard than the 5th one. Put vegetables on the top shelf in the refrigerator and put unhealthy foods in the bottom crisper. After 1 week, people ate almost 3 times more fruit and vegetables than the week before simply by making these foods more visible. Eat from plates and bowls that are a contrasting color to the food. The color of your plate can make you fat – people served themselves and ate 18% more food when their food and plate were the same color. A serving of food on a smaller plate looks bigger. You’ll serve yourself (and eat) more food on a larger plate (12”) than a smaller one (10”) and bigger bowls were shown to lead to bigger children. Serving a batch of food from a large serving bowl led to 14% more calories being dished out per serving than placing the same initial amount of food in a smaller serving bowl. People who served their meal from the stove or counter and then went to the table to eat ate 19% less total food compared to those serving themselves right off the table. However, feel free to put the bowl of salad right in the middle of the table! A snack-food audit of 122 office workers revealed the average worker had 476 calories’ worth of food IN their desk within arm’s reach. Admin assistants who moved their candy dish from “on” their desk to “in” their desk (ie, in a drawer) ate 74 less calories every day. People at work who had a candy dish on their desk weighed 15 pounds more than those who didn’t. When eating out, people who sat at a high-top table ate more salads and fewer desserts; those who sat at well-lit tables ate healthier foods overall. Diners who sat at tables near the TV ate more fried food, while those who sat farthest from the front door ate the fewest salads and were 73% more likely to order dessert. When eating at a buffet, sit facing away from the buffet…73% of slim diners sat facing away from the buffet. Slim diners also “scouted” out the buffet before ever picking up a plate; 71% of them walked around and scanned the available food items to see what they liked and wanted. Whereas heavier diners did the opposite and started serving a little bit of everything on their plate. Slim diners also trotted to faraway booths, whereas heavier diners were 3 times more likely to face the food and, on average, sit 16 feet closer to the buffet. Dr Wansink and his team also observed that people who made 1 or 2 changes and stuck with them for an average of 25 days a month were more successful at losing weight. I would love to know what changes you’re willing to make this month to eat healthy and lose weight. Share them in the Comments below! Wansink B. Slim by Design: Mindless Eating Solutions for Everyday Life. . William Morrow, an imprint of Harper Collins Publishers, 2014. Kindle file.